A concept that TRG has grown to be closely identified with is creating pocket neighborhoods. Defined by Ross Chapin, the leader of designing pocket neighborhoods across the US defines them as a “cohesive cluster of homes gathered around some kind of common ground within a larger surrounding neighborhood.” TRG Communities has led the region in creating pocket neighborhoods, developing a collection of pocket neighborhoods at Carilion or an infill pocket neighborhood in downtown Greenville at Pendleton West. 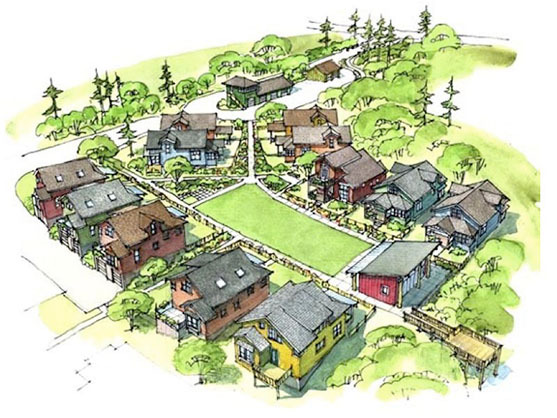 Designing pocket neighborhood deeply resonates with our style of creating imaginative places, neighborhood lifestyles, sustainable communities, and community connections. An inspiring pocket neighborhood first off makes it’s visitors and residents come alive, whether that is with a brisk autumn walk along a tree-lined sidewalk or taking a sip of refreshing iced lemonade on an oversized front porch. Pocket neighborhoods are fundamentally focused on the architectural and landscape design with details such as an eighteenth-century inspired garden or a craftsman style front porch. However, the brilliance of a pocket neighborhood is truly seen when inspiring design draws together a group of individuals and families into a community. The design of a pocket neighborhood returns back to the natural scale and order of early human settlements such as villages, barrios or even campgrounds. Contrary to the traditional suburban communities that has exchanged the human-centered scale for an automobile-centered scale. Neighborhood lifestyles are cultivated in pocket neighborhoods through unifying amenities, such as resort-style pools, farm stands, or green spaces. When creating imaginative places that promote neighborhood lifestyles, an essential component is to ensure they have a sustainable impact for future generations. A pocket neighborhood looks at low-impact development with a bent that preserves and protects the natural habitat, whether that is protecting surrounding wetlands or building a community garden. Pocket neighborhoods also promote sustainability within its residents that are constantly able to engage and interact with the natural environment through meandering nature trails or gardens. Redfearn in Simpsonville, South Carolina. A completed TRG Community. Lastly, pocket neighborhoods promotes community connections amongst it’s residents. A concept that Ross Chapin further explains in his book Pocket Neighborhoods is that pocket neighborhoods create gardens of compassion. In communities that allow neighbors to connect, they can clearly see the needs of others, subsequently bringing out the best in neighbors. A neighbor may be able to watch after a young child playing on the corner, volunteering at the neighborhood daycare, or fixing a meal for a sick neighbor. Pocket neighborhoods will continue to be communities that thrive because of their imaginative design, neighborhood lifestyles, sustainable impact, and community connections.